A few years ago, I reviewed and recommended a laundry soap called Charlie’s Soap. Charlie’s Soap continues to be on the top of my list for hand washing your clothing on the road, but there’s another laundry soap I can also recommend. The product is called Purex Complete 3-in-1 Laundry Sheets, and since this is made by soap manufacturer Dial, they are available in most supermarkets in the laundry aisle. 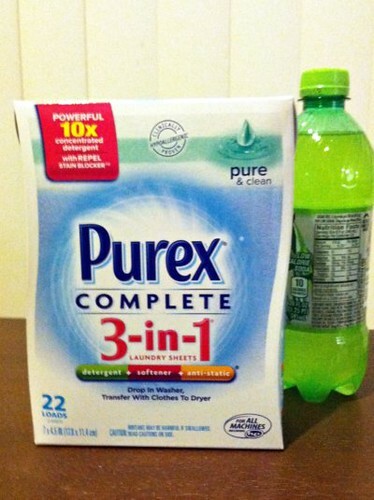 A box of Purex Complete 3-in-1 Laundry Sheets, next to a 20-ounce bottle of soda for size comparison. 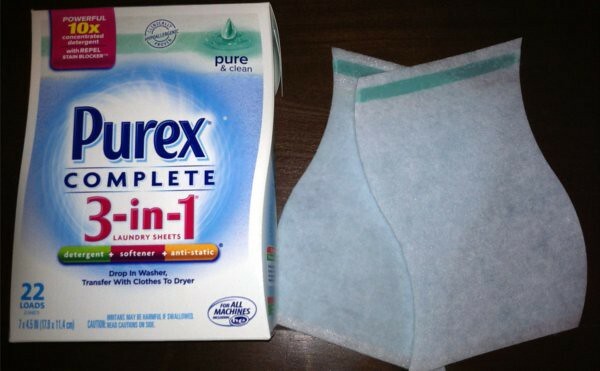 If you’re familiar with laundry dryer sheets Purex laundry sheets use a similar concept. Instead of tossing this in the dryer with your clothes, however, you actually toss it into the washing machine from the beginning. When your wash is ready to go into the dryer, you just move the Purex laundry sheet in with your clothes. A couple of sheets taken out of the box. These Purex laundry sheets offer maximum convenience when you’re traveling. Both the soap and conditioner/anti-static portion is infused in the sheet. There are no liquids or flakes to fall off of these sheets. Most convenient of all is that these are sized to fit into a quart-sized resealable zip baggie. This allows you to take the laundry sheets out of the box and travel with several sheets in your carry-on. It even packs completely flat, so it will take up almost no room in your bag. 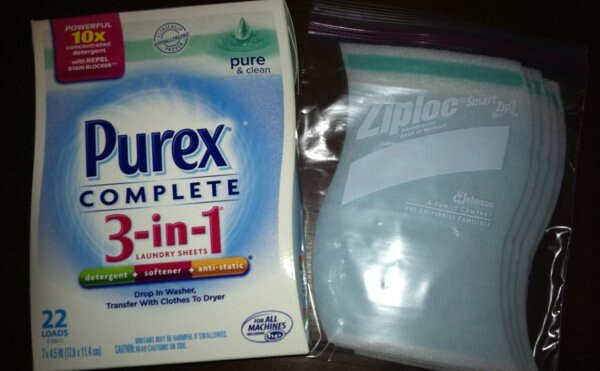 You can easily pack several sheets of Purex laundry sheets into a quart-sized Ziploc bag. These laundry sheets only work for washing machines. They are not an option if you plan on using your hotel sink for handwashing your clothes. The box shown here is their “Pure and Clean” version, which has no noticeable fragrance. Purex offers two other variations: “Spring Oasis” and “Tropical Escape.” Both of these are very strongly scented, and my personal preference is to go with the unscented version. These laundry sheets are best when you’re ready for one big load of laundry, which means it’s more convenient if you’re traveling with a partner, or a family. You’re less likely to need to do a whole load at once if you’re traveling solo, since you’re less likely to carry so much clothing (especially if you know how to travel light!). There is no easy way to use just a portion of the laundry sheet, so even if you have a very small load, you will use up a whole sheet. These laundry sheets fit the plain quart-sized Ziploc bags, but will not fit in Ziploc’s pleated zippered baggies (which are not as tall as the regular quart-sized version). These laundry sheets are not cheap. A box of 22 sheets costs around $10 each, quite expensive when you compare it to liquid laundry detergent. As an example, a two-bottle set of 50-ounce bottles of Tide laundry detergent goes for $15.00 at Amazon, and is good for a total of 64 loads, making these Purex laundry sheets at least twice as expensive (and I suspect you can buy liquid laundry detergent at your local supermarket at prices far better than from Amazon). The price difference is considerable when compared to a container of Charlie’s Soap, which for $12 lasts 80 loads. Overall, even with these caveats, I believe Purex Complete 3-in-1 Laundry Sheets are a great option. You can’t beat their convenience and packability. If they are a little bit of a stretch for your budget, keep your eye out for smaller trial-size packages with just a few sheets in them. Otherwise, buy a small box and reserve them just for your travels. These are a great idea, if you know that there are machines available. They are much smaller and easier to pack than soaps and you don’t have to worry about buying soap and throwing it out because it won’t fit in a carry-on. However, you have to kind of plan ahead and research if machines will be available. My family tried something like this once thinking it would be a great idea only to find out our end destination didn’t have washing machines available for visitors, so be prepared in case you run into the same problem. I definitely agree that you need to do a bit of research. Fortunately, many hotel websites will tell you if they have laundry facilities, and if not, a quick email to the hotel should tell you if a washing machine is available. Fortunately, these sheets are so thin, so even if you wind up not being able to use them, you haven’t taken up too much room in your bag. I’ve actually used these for sink washing and they work fine – with some adjustments, the biggest being you can’t use the softener end. I cut that off and slice the rest of the sheet into strips (about 16 strips per sheet). Toss a couple in the sink before you fill with water so the soap starts coming out, then toss in your clothes. Worked great on my last trip to Spain and I plan to repeat this spring. I use these, both at home and in traveling. I have found that for smaller loads, cutting them works well. I have cut them either in half, or in thirds, the LONG way (to make sure my ‘dryer portion’ is added to each load), and they work just as well. Also, to save even more space, I usually fold them up before placing them in my ziplock bags. Finally, the price per box has come down! I just bought a box of 22 for $5.32 at my Wal-Mart, which makes them even more worth it! I have used these on two seperate trips through Asia when doing sink laundry. Before I leave I cut off the “dryer sheet” portion and then cut the entire sheet in half. When it’s time to do laundry I run the sheet(s) under the faucet to get the soap out (it dissolves in water to free it from the sheet). I swish my clothes in the water to get some suds going. I don’t have to buy soap at my destination and don’t have to take up valuable 3-1-1 space. You can cut the sheets into strips for smaller loads. My mom does this all the time, since she and my dad are the only ones living at home now and usually just do small loads at a time. Might want to cut them into thirds (top to bottom, so you get all the portions of the sheet) before you go, and if you end up doing a full load, then just use 3 of the mini-sheets. I love these but have been having a hard time finding them lately. They are great for NYC apartment dwellers, because every inch here is valuable, and these take up a lot less space than all the other items they are replacing. I don't have any problems using these sheets for handwashing clothes, they foam up nicely in the sink and I can easily hold them and scrub against any stains. I do find one sheet too large so I cut them in half and cut off the softener strip at the ends. A definite improvement over carrying liquid Tide etc. I used to use a natural non-chemical soap but prefer these sheets. Paula — It never dawned on me that I could cut the sheets up! Thanks for the great tip. Ashley — I never thought about cutting these up, but it makes perfect sense. Thanks for the great tip! I contacted the company in search for these (I had ran out) and they no longer sell these and directed me to an on-line site that still has some for sell. Could you cut them lengthwise to use for two small loads? You sure can! As long as you cut it lengthwise, the sheets will stay together at the top. I’ve done this and it works just fine on smaller loads. Well, I have come to choose squirrelsoaps for my body, my toddler and for clothes also. These have only natural ingredients and I feel they are of good quality. Got them online for just 3$ a piece. “There is no easy way to use just a portion of the laundry sheet, so even if you have a very small load, you will use up a whole sheet.” YES THERE IS… Scissors, I cut them in half or in thirds almost all the time when I travel for my smaller loads of laundry. Simple and inexpensive.